Triple-output secondary-side power supply ICs developed for automotive electronic control units, or ECUs. There are a number of electronic control units, or ECUs, installed for managing a variety of automotive functional systems. Each ECU has a set of controller microprocessors and other application-specific integrated circuits, in order to handle the complicated signals and information transmitted to and from other ECUs. The power supply voltage for the microprocessors inside ECUs ranges from the traditional 5V to lower 3.3V and in some cases as low as 1.2V. In addition, in response to the additional power supply needed for auxiliary applications outside of the ECUs, automotive-use secondary-side power supply ICs has increasingly adopted multiple-voltage output platforms. We have successfully introduced to the market an innovative power supply IC able to minimize the footprint of circuit board and thereby the total physical dimensions of ECUs, by converting our power supply ICs from conventional dual-output to triple-output. In order to accommodate the need for multiple-voltage output from power supply circuitry, the conventional solution only offered a pair of two power supply ICs, one dual-output and additional single -output, but we were able to combine the two and to assemble a triple-output in the conventionally sized, small power surface-mount package. This in turn could shrink the total size of an ECU circuit board by as much as 20%. The aggregate number of parts and components used was also dropped by as large as 25%, to save materials necessary for the circuit. The shipment had started in October 2015, and we projected the shipment to increase up to as many as 100,000 per month in 2018. We are now looking into the future when we develop and market brand-new power supply products to offer solutions for the ECUs whose appetite for ever larger number of voltage output, with adopting ever smaller packages and quadruple or more outputs as well as upgrading the reset function. 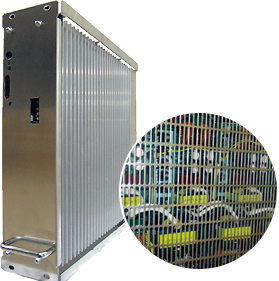 Our customers are increasingly demanding reduced size and higher efficiency, even in large wattage power supplies for use in industrial machines, such as semiconductor manufacturing equipment and production-line robots, as well as machines in financial industry such as ATMs and money changers. Those machines and equipment must also are expected to withstand and operate normally at temperatures that are 10°C higher than the conventional specifications require. 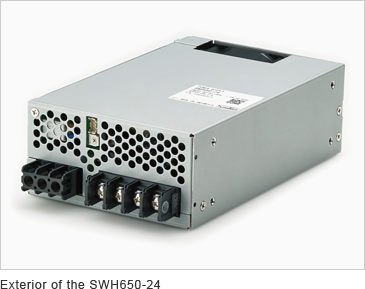 We have successfully developed 650 W-class large-wattage power supply modules, SWH650-24 and SWH650-48, which can meet these demands. 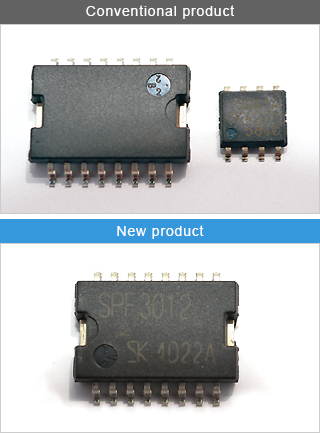 These power supply modules are uniquely characterized by use of our company&apos;s SiC, or silicon carbide, diodes, which are highly efficient even under high thermal conditions. They also use our uniquely designed resonance mode circuitry and employ more efficient MOSFET in the rectifier circuitry. Through these efforts and ingenuity, we could increase efficiency from the conventional 86% to 93%, and contributed to a significant reduction in the power loss experienced by our customers. We are also highly focused on the importance of reducing our products&apos; dimensions and weight. 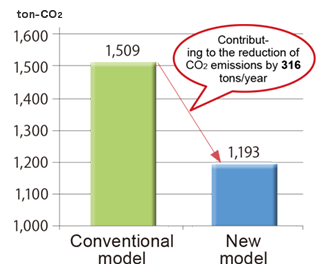 As the projected number of this improved new product is at 13,900 units per year, the resultant reduction of CO2 emissions affected by the improved efficiency is calculated to be approximately 3,840 tons per year less, than it could have been if we stayed with the old products. In the future, we are set to diversify our offerings by designing and marketing yet larger wattage products at approximately 1,000W range, and at the same time to launch smaller wattage 300W range products by leveraging the experience we gathered from this 650W machine. In recent years, regulations on power supply efficiency have become stricter due to a number of issues such as environmental destruction and shortage of energy supply, both caused by increasing demand for energy in the world. Various regulatory norms have been established in a number of countries, and AC adapters, for example, known as external power sources for use in mobile devices, small home appliances and telecommunication terminals. 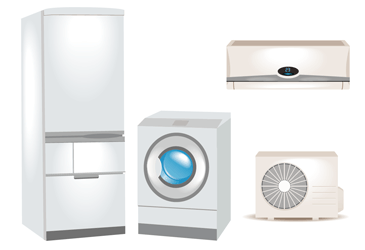 The EU&apos;s ErP, or Energy-related Products, directive is deemed to be the strictest of such regulations. This directive stipulates that the average efficiency of external power supplies, i.e. 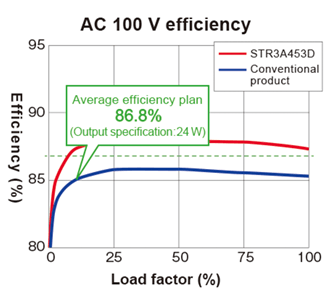 the average of 25%, 50%, 75% and 100% load factors, shall be 86.8% or greater for 24 W outputs. To meet the requirements of this directive, we identified the two component parts that suffers the largest loss and successfully improved the conventional power supply IC to overcome this issue. The first is the reduction of the loss at the secondary-side rectifying diode. The goal was achieved by suppressing the surge voltage when the primary-side power MOSFET is turned on. The second is the reduction of the switching loss at the primary-side power MOSFET. The target was achieved by optimizing the oscillation frequency in accordance with the load. 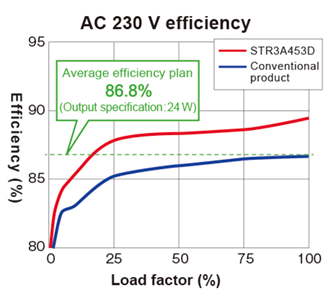 As shown in the diagram, both of the two cases of 100 V and 230 V input voltages exceed the average efficiency standard of 86.8%. It used to be consensus knowledge that it is difficult to improve the power supply&apos;s efficiency in the light load range. Contrary to the common sense in the industry, however, an approximately 2.5-point favorable effect was observed at the load factor of 25% or less with the 100 V and 230 V input voltages. The new STR3A400 series achieve high efficiency under any load condition, regardless of the operational conditions of the equipment being used. Consequently, the power supply IC greatly contributes to satisfy the external power supply's requirements under the ErP directive Lot7. Further, the IC is most suited for any application areas including such markets as office equipment, white goods home appliances, and audio visual equipment, etc. We are committed to keep on developing and offering power supply systems in the future not only in compliance with, but also in environmentally forward-looking to surpass, the ever stricter efficiency standard now being effectuated in various countries in the world. Air conditioners, which are subject to the "Top Runner Standards*" the Japanese government's policy to set the conservation criteria at the highest level presently commercially available to induce development of highly energy efficient products, are required to achieve lowest loss for both cooling and heating, because the standards assumes year-round operation. Both indoor and outdoor air conditioner units are equipped with motor driver ICs used for driving the fans. 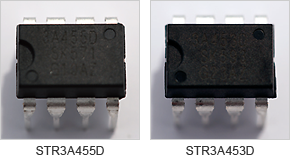 In particular, these motor driver ICs are now expected to offer very low electric power consumption when running at very low power and thus current range. We have successfully released a new product which operates in dual modes; a normal and a stand-by operating modes. 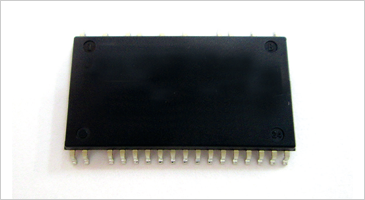 The motor driver IC can reduce the power consumption all the way down to approximately mere 3% of conventional ICs. In the future, we plan to develop new products which are targeted to, and housed in a package for, large power motors. It is not feasible to calculate accurately, as the motor&apos;s inoperative lapse of time differs greatly depending on the indoor temperature. * The "Top Runner Standards" as defined in the Act on the Rational Use of Energy, refer to the measures relating to machines and tools, which require manufacturers to establish and fulfill standards for manufacturing energy-saving products. Under certain circumstances, our customers may request naturally-cooled equipment without cooling fans, to be installed in a place where extra-high reliability and very low-noise level are absolutely required. There are other types of requirements such as decreasing physical dimensions and raising power conversion efficiency, while at the same time satisfying standards for the quality of electric power in recent years, such as suppression of harmonics and reduction of equivalent reverse phase current. To meet all these requirements, we have completed development of a new product that has the following improvements compared with conventional models. Harmonic suppression implemented by a power factor corrector (PFC) circuit. This product has 3-phase AC 200 V input and DC 48V 50A output. By improving the conversion circuit, we raised the efficiency from 90% to 93%. Compared to conventional models, the power consumption per unit was reduced by approximately 98.6W under specification conditions. 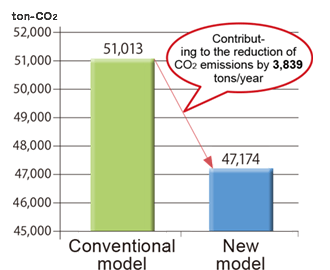 As we plan to ship approximately 300 units per year, reduction of CO2 emissions reaches as high as approx. 145 tons per year compared to what they would have been with conventional products. Furthermore, this product significantly reduces its size as shown in the table below. As private companies are required to observe provisions of the revised Act on the Rational Use of Energy, we must strengthen our efforts to reduce CO2 emitted by production and consumption of energy. For this purpose, we have developed a new product for lighting systems which are optimized for energy-saving in factories and warehouses. These high-efficiency LED-lighting fixtures can be readily mounted thanks to their high workability and shorter installation time, thus contributing to yet additional energy saving. We chose new materials for the coverings for the light emitting portion to improve the amount of light coming through the cover. The power supply portion also achieves high efficiency by combining our IC design and circuit topology technology to optimize the output best suited for the LED&apos;s characteristics. 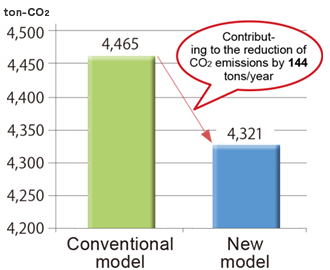 The new model reduces power consumption by approximately 21% compared with conventional models. 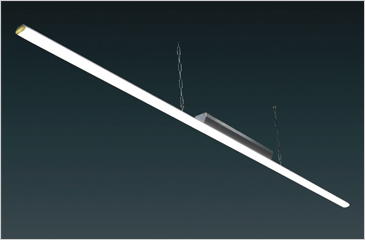 This LED-lighting-fixture's noise level is ultra-low, allowing it to be installed in such highly noise-sensitive areas as data centers, as it satisfies the CISPR15 standard, which is far more comprehensive than Clause 1 of the Ordinance of the Ministry on the Technical Criteria of the Electrical Appliances and Material Safety Act. Going forward, we plan to broaden our product portfolio, continue to develop lighting fixtures that emit light which is close to natural or with rich and quality color rendering properties, and explore brand new applications.